Tutor Led Hands-on Blubber Glove Activity! 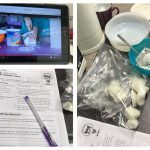 In Science our home-schooled children have been busy making a blubber glove and have been exploring what blubber does in the cold and in the heat. To prepare, the children gently kneaded the vegetable shortening and distributed it evenly between the bags. They then placed their hand inside the blubber glove and dipped the gloved hand into the cold water for one minute. After this, the children were instructed to place the warm washcloth inside the blubber glove and feel the outside of the glove. This activity helped the children investigate the insulating properties of blubber.